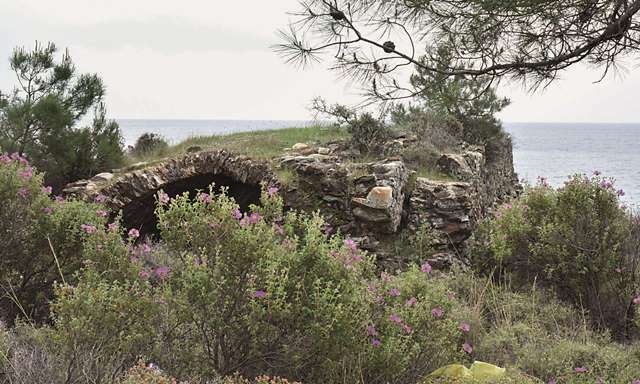 Perched above the Mediterranean Sea in a natural cove once used as a haven for pirates, the Romans and the Seljuks, this recently-discovered han may have been built as a checkpoint for sea activity. The Melleç Han is located on the Alanya-Anamur road, to the east of Alanya, 20 km from Anamur. It is built on the section of the road which leads down to the coast and is at the end of the beach where the rocks descend to the sea. 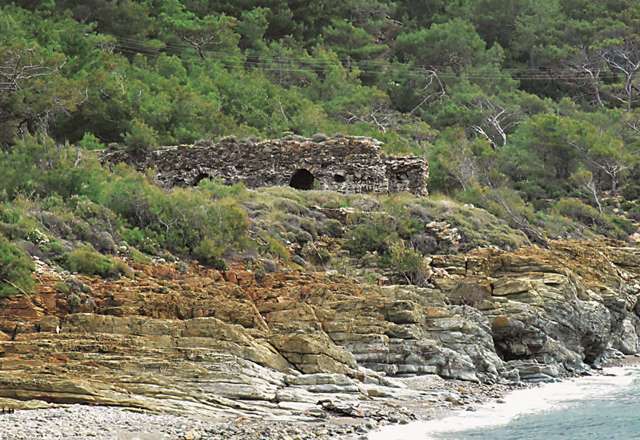 The cove here is a natural port, and pirates and trading ships have used it since Roman times. Seljuk merchants traded here before the conquest of Alanya in 1221, using for the most part the port of Ayas. The han is situated in the region where merchants coming from Konya crossed the Taurus Mountains to reach the coast between Anamur and Alanya. It is believed that the merchants who transported goods by ship stayed here and used the han as a storehouse, yet the location of the han is not favorable for loading and unloading of goods from ships. More probably the han was built later in the 13th century to serve as a checkpoint for sea and road activity. At one time the ancient city of Charadrus, known today as Kalediran, was located near the han, at the site of a cove which is a natural port. The location of the han was certainly chosen in relation to this cove. The coves in the region were used by pirates and trading ships since the Roman period, so this han could have served the same purpose. The Seljuks used to trade by sea from the port of Ayas before the conquest of Alanya, and might have used Melleç as a minor port near Alanya. However, this cove is not a place where ships could have easily loaded goods, so the han probably only served merchants coming from land. Another theory is that this han was built for communication and monitoring the coast. The han is named after the nearby settlement of Melleç. The han is comprised of a covered section with two naves of equal size, covered by pointed vaults. The vaults are supported by four pointed arches resting on three square piers. There are other hans built in this style, but it is not common. These hans include the second han near Kizilören Han between Konya and Beyşehir, the Kargi Han near Manavgat, the Kozak and Sertavul Hans between Karaman and Silifke, and the Kefendur and Kermete Hans on the Bitlis-Diyarbakir road. It is believed that hans with two naves developed as a sub-set of single nave hans, which were common during the Seljuk period, such as the Şarapsa, Derebucak-Tol and the Kuru 1 Hans. The naves, of equal size, are separated from each other by a line of arches. There are four pointed arches supported on three square piers. Three arches are in good condition and parts of the fourth are solid. The southern section of the west barrel vault is mostly ruined, while the other vault is in better condition. The south and north edges of the east nave are partially ruined. Access to the han is via the door which opens in the middle of the south wall. The ruins provide no evidence of windows. There is no mosque. The han was built of pitch-faced stone and rubble. The travertine stone used here came from a mine near the han. The foundations and walls are very thin, which could be the reason for the substantial damage to the building. There are traces of lime mortar plaster on the inner walls. The joints of the walls are filled with a type of lime mortar known as “khorasan mortar”. There is no inscription or mosque. 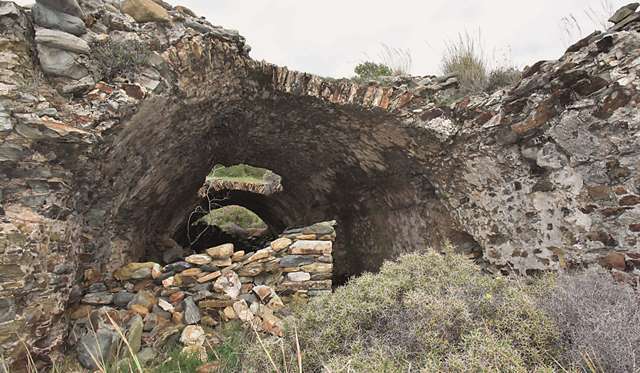 A Seljuk bridge and a hunting and pleasure pavilion are located to the north of the han. The han is in a ruined state. 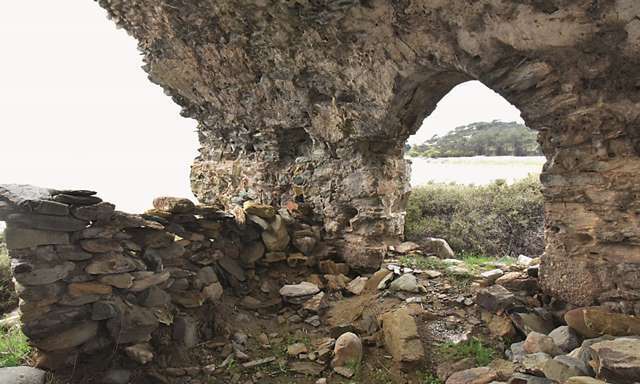 Some sections of the vaults and the east wall remain standing, but the han is in a ruined condition for the most part, the stones of its walls having tumbled down to the Mediterranean Sea over the years. All walls have collapsed except for the east wall. The north side of the han is below ground up to the top of the vault. Eravşar, Osman. Yollarin Taniklari (Witnesses of the Way), 2017, pp. 97-101. Redford, Scott. Landscape and the State in Medieval Anatolia: Seljuk Gardens and Pavilions of Alanya, Turkey, 2008. Turan, O. “Selçuklu Kervansaraylari”, Belleten X:9, 1946, pp. 471-496. Yavuz A. T. "The Concepts that Shape Anatolian Seljuq Caravanserais". In Muqarnas XIV: An Annual on the Visual Culture of the Islamic World, 1997, p. 12.